Early this morning our on-site fledge watchers reported that Seneca took her first flight! With that, all five of the 2008 eyases have fledged, bringing to 43 the total number of fledglings produced by Mariah at the Rochester site in eleven years. It’s a remarkable feat that’s unmatched by any other site that we’re aware of! You can read updates about Seneca and the other fledglings from Lisa McKeown and Carol Phillips in our FalconWatch blog! If you missed our recent Fledge Watcher Orientation meeting, don’t despair! You can still participate. First, download and print a copy of our 2008 Fledge Watch Brochure. The brochure provides an overview of information that you need to be a successful fledge watcher. It includes a list of contact numbers, recommended fledge watching gear and instructions for how to rescue a downed fledgling. Next, check out the Fledge Watch Calendar. Fledge watch shifts are available from 7AM to 9PM every day from now through mid-July. You can sign up for as many or as few shifts as you want. We request that shifts be two hours in duration or more, but whatever amount of time you can volunteer will be greatly appreciated! And don’t worry if you see that someone else has signed on to the same time you’d like to watch. The more watchers we have out at one time, the better we can cover all the ground once the fledglings start really flying. Be sure to include your name and the dates & times for the shift or shifts you’re interested in filling. And to make it easy for Lisa to pick out your email from all the rest, be sure to include the words “Fledge Watch” in the subject line. 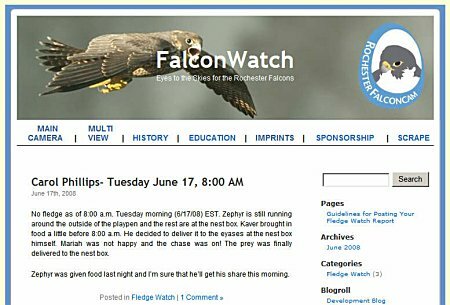 While you’re looking at the calendar, take a moment to browse the other pages at the Rochester Falconcam’s FalconWatch Blog. We’ve included helpful guidelines for posting your fledge watch reports and using the FledgeWatch blog. You won’t be able to post your report on the FalconWatch blog until you’ve been accepted as an author at the blog. We’ll send you a username and password that will allow you to post your fledge watch reports. Finally, have fun! Fledge Watching provides a rare opportunity to see one of nature’s true marvels up close, and to help ensure the safety of the fledglings. You’ll most likely find a group of “regulars” nearby who’ll be happy to walk you through the basics, so come one come all, and join the 2008 Fledge Watch! We won’t give away all the details, because that honor belongs to the watchers who’ve been out for hours this morning and afternoon watching after our newest falcon fliers! We’ve had 2 fledges so far today– one this morning and one around lunchtime. Be sure to check out our FalconWatch blog for all the latest news! For 2008 we’re introducing the FalconWatch blog! The FalconWatch blog will store all of the reports from our fledge watchers throughout the summer and beyond. You’ll be able to comment on the reports just as you can with the articles posted at Imprints! We’ll be adding links for the new blog to the Rochester Falconcam website soon. In the meantime, you can click the link above to read the first three fledge watch reports, or click the FalconWatch Blog link on the right side of the Imprints screen. 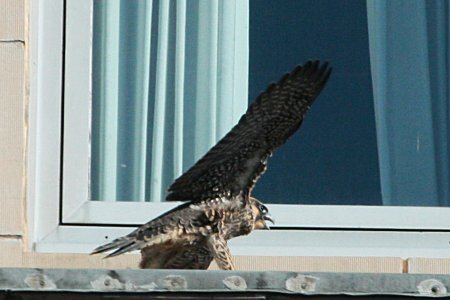 While the watchers skipped lunch for a chance to see the falcons today, Linn enjoyed a nice meal. You can view pictures and video here. I stopped down to the bridge this afternoon for a short visit. After waiting a half hour with no juvies in sight, I decided to head back to work. However, just as I was getting into my car, Carol P called to me to say that Linn was in the tree. I only managed to snap a few pics of Linn eating a small bird, before heading back to work. I wondered if this was a catch that Linn made by herself – I didn’t see a food transfer. Here are some of the pics I took. Fledge Watch- Carol Phillips- Sunday, July 15, 9:00a.m.- 2:00p.m. If you were wondering if Mariah and Kaver were still feeding the juvies, the answer is yes. During my Sunday Fledge Watch, both Mariah and Kaver delivered food to Ananta, Linn, Grace and Sacajawea. All six Falcons were seen during the day, spending most of their time in the Genesee River Gorge area. Here’s a Kodak EasyShare Gallery Album with pictures from Sunday’s watch. You know, just when you think you’ve seen it all with falcon watching, something unusual happens that reminds you that there’s always something new to see. This album captures on of those moments. Fledge Watch- Carol Phillips- Saturday, July 14, 8:00a.m.- 2:00p.m. This question was answered during my Fledge Watch on Saturday, July 14th. Many Falcon Watchers were on hand to watch Grace land on the edge of the island below the pedestrian bridge. At first she tentatively walked into the Genesee River. As Grace became more comfortable, she walked out a little further and started to bathe, by flapping her wings and splashing water over her body. That’s when it got really interesting. We returned to the river gorge this evening to check on the Rochester Falcons. We saw a few bird chases and one food transfer while we were there. There were also some Great Blue Herons and a handsome buck in the gorge. These are some of the pics that I snapped. Note: If anybody can identify the bird that Sacajawea is chasing in this album, please comment with an ID. You are currently browsing the archives for the Fledge Watch Reports category.